High quality LED modules and drivers and high performance optics combine to provide high levels of useful light output for less energy input. Retail specific luminaire optics provide good levels of vertical illuminance, accurately and efficiently providing the correct light at the required place. Providing the required levels of light onto the task with minimal spill light reduces over-lighting of surrounding areas, providing the correct light levels to all areas whilst minimising energy use. Like every national retailer, Wm Morrisons has energy and carbon reduction at the top of its green agenda. Head of Energy at Wm Morrisons, Stuart Kirk, has a target to reduce energy expenditure by €20 million while maintaining high quality lighting, which is so integral to the shopping experience. In May 2012 Stuart approached Thorn to request a bespoke retrofit LED luminaire, which could be easily mounted into the Thorn Arena Trough system. 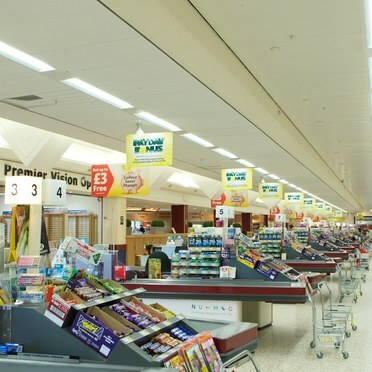 The recessed system had been installed in most of the traditional Wm Morrisons stores for over 20 years using fluorescent T8 lamps and HF control gear. Stuart therefore saw an LED solution as a quick-win to reducing the overall lighting load. 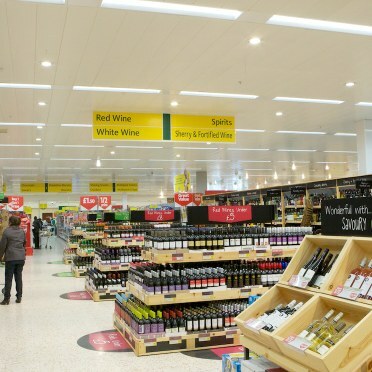 Thorn worked with Ian Jagger, Electrical Services Projects Manager at Wm Morrisons and project management and installation partner, IES to develop a bespoke LED luminaire for the high level shop floor lighting which would replicate the distribution of the T8 luminaires with improved performance. Bevelled and flat luminaire designs were put forward with extensive trials at the headquarter mock-up store in Bradford. The conclusion was that the bevelled solution better suited the required look and feel. Thorn also worked with project partner, Tridonic, to build in the Stark LLE 24 panels with LCI 070 300 drivers to produce a luminaire with efficacy of 91 Lm/W. An opal panel was used to diffuse the LED light source to reduce glare and 300mm blanking plates were installed between each fitting to match the current ceiling layout and improve the uniformity and aesthetics. 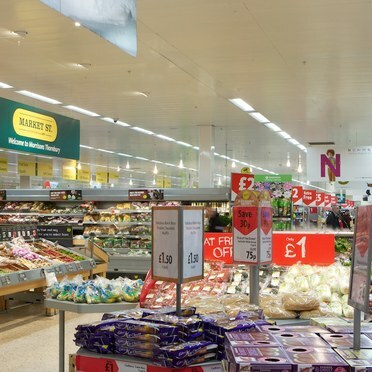 By replacing the old fluorescent T8 lamps and HF control gear (140W) with the latest LED technology (52W), Wm Morrisons benefits from 63% lower energy consumption. By using the LED solution it also allowed for the total number of luminaire to be reduced slightly which increased energy savings from 63% to 70%. The improved luminaire efficacy has also increased the store lighting levels and improved uniformity. This gives a much brighter and uniform feel with a crisp colour temperature of 4000K. The specifically designed retail optics also provide improved vertical illuminance to ensure products on the shelves stand out to customers. As part of the solution, Thorn additionally trained the installing contractor to develop a quicker installation method. This was because it was important that the system could be installed across a store within three nights during closing times. For more information about Arena, contact your local sales organisation.